Last fall a series of seemingly unrelated things happened. I was still struggling with panic and despair at times but beginning to feel like myself occasionally. In October, I needed a yellow shirt, so I was perusing Goodwill where they conveniently arrange all their clothes by color. And then I saw it. I knew it was mine. A phoenix. About a week later, I received my birthday present from my Dad. Among the various items was a necklace with a seagull in flight. I loved it and put it on immediately. He will give the weary strength. Around this time, we also watched the movie “Maleficent” as a family. In the film, Maleficent is originally a good fairy with giant brown-feathered wings. The image of her giant wings spreading out behind her stuck with me, but I didn’t connect it with my phoenix shirt or my seagull necklace. A few days later, I was singing Ellie Holcomb’s song in my head, “Those who hope in the Lord will renew their strength…” as I prepared to start my morning meditation. Next to my bed was a little flip calendar with scriptures and uplifting messages for each day of the year. I decided to flip it to see what the scripture was for that day. I had to laugh when I saw it: “But those who hope in the LORD will renew their strength. They will soar on wings like eagles; they will run and not grow weary, they will walk and not be faint” (Isaiah 40:31, NIV). There before my eyes were the very words that had been playing in my head that very moment. It’s sort of hard to describe what happened next. As I meditated, somehow all these scattered pieces and images flashed into my head: all the images of birds, all the images of wings, all the songs, and scriptures that had been coming back to me over and over. And all of a sudden, I felt wings sprout out of my back… whoosh! I was stunned. Did that just really happen? Was I imagining it? I couldn’t see them, but I could feel them. I was skeptical… as usual. God often has to hit me over the head with things repeatedly. The next morning, I was sitting in our backyard, reading a book. As I sat there, a butterfly fluttered over and landed next to me. It sat there for a while, gently opening and closing its wings. I stared at it. Wings. Hmm. A couple of hours later, we went to the Phoenix (Phoenix, ha!) temple dedication broadcast. A choir sang the opening song… “Come, O thou King of Kings! We’ve waited long for thee, With healing in thy wings, To set thy people free.” Wings. Hmm. As if that wasn’t enough, the next day I received a package in the mail from a friend. It was a bracelet with two birds in flight. A few weeks later, a friend gave me a Christmas ornament. She said it reminded her of me when she saw it. It was an angel with wings, kneeling in prayer. A few days after that, my mother-in-law gave me a porcelain heart with a dove in flight on it. She said she felt like it was for me. A few weeks later, I was perusing Goodwill again. I swear one of my guardian angels decided to have some fun with me that day, ’cause everywhere I looked there were wings. Just when I thought I couldn’t possibly find any more wings, more would appear. I laughed and laughed. OK, OK, I hear you. Since then I have had many more experiences with eagles and wings. Eagles appeared in several of my imagery journeys at our guided imagery training in January. In one, a flock of giant eagles (like in LOTR) told me to eat an eagle egg (like in Nacho Libre) and I transformed into an eagle. That imagery training was actually taking place at the crossroads of… I kid you not… Eagle Crest Drive and Power Road. Eagle Powers! I had to smile when, at my first day of yoga teacher training, our instructor had us do a yoga kriya, saying, “Now stretch your arms out to your sides and flap them up and down and imagine you are an eagle soaring through the sky.” It was one of many experiences I had that day letting me know that my eagle self was right where she needed to be. So, I guess God gave me wings. What does that mean? As I have pondered it over the past several months, I have come to believe that the wings are a symbolic representation of the gift God promised me when I was sixteen in my patriarchal blessing. The wings are a reminder to me that I can “flee from the face of the serpent,” be protected from the vicissitudes of this life, run and not grow weary, walk and not faint. And all of this so that I can serve God and fulfill my missions on this earth. Wings also represent gathering, grace, and protection in the scriptures, so I believe my wings are also a gift to enable me to gather others to God’s safety. So if you’ve noticed that I’m maybe a little bit obsessed with wings lately… this is why. Lani, I am so excited to see what you do with this new blog. 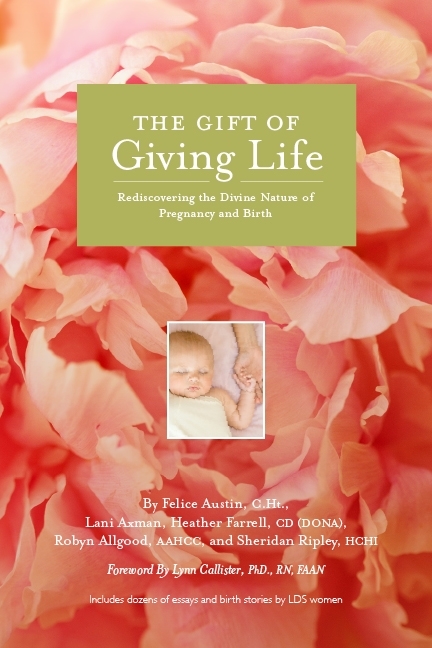 I have followed Birth Faith for years, eagerly watched you and your coauthors give birth to The Gift of Giving Life, and, as a survivor of anxiety myself, I have prayed for you countless times over the last few years as you have struggled. I have a great love for you, and I hope that doesn’t sound weird. Love and blessings to you. Keep flying!